Broken bones can be immensely painful and debilitating. Broken bones account for over 6.8 million medical treatments each year at various hospitals, emergency rooms and doctor's offices across the United States. Most minor fractures can be treated using casts, braces and traction devices. Occasionally, surgeons also replace the broken or missing bone fragments using bone grafts. Grafts may be derived from the patient's own body (autografts) or from a donor (allografts). Although autografts and allografts have been in use for decades, they have several disadvantages. It is often difficult to find a compatible bone fragment. Furthermore, these implants degenerate with time, and most patients require a replacement surgery after 10 or 15 years. This surgery can worsen pain and lead to other complications, especially in the elderly. To overcome some of these deficiencies, researchers at University of Toronto, under the supervision of Professor Bob Pilliar, began looking for special compounds that can be used to form artificial bone grafts and fragments. They discovered calcium polyphosphate that makes up approximately 70 percent of a natural bone. Mihaela Vlasea, a mechatronic engineer at University of Waterloo, then developed an indigenous 3D printer that uses ultraviolet rays and light-reactive binding agents to fuse the calcium polyphosphate molecules into bone fragments. The implant has a porous structure that allows the real tissue to grow over time. Subsequently, the implant is broken down naturally in the patient's body. Apart from treating fractures, this technology can also be used to produce replacement joints and cartilages for arthritis patients. The porous nature of the 3-D printed grafts, however, makes them brittle and unmanageable at times. Researchers at Nottingham Trent University are working to further strengthen the bone implants by growing unique crystal structures within the bone scaffold at sub-zero temperatures. This technique may also reduce the time required to print the bone fragments. Some healthcare professionals are already using 3D printing technology in patients. 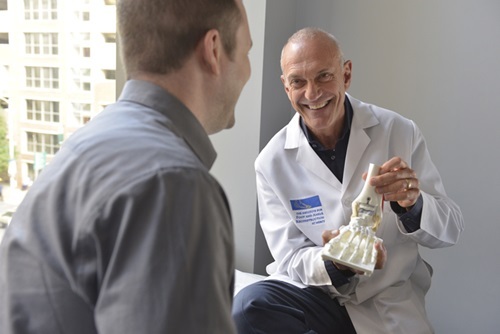 Dr. Mark Myerson, an orthopedic surgeon at Mercy Hospital, Baltimore, relies on 3D printing services offered by 4Web Medical to create customized ankle bones that can be implanted into the patient's feet to replace a broken ankle. He has used this technology to help patients with talus bone fractures, who tend to lose blood circulation in the area. Consequently, the bone dies and begins to crumble leading to a flat and painful ankle. 4Web Medical uses CT scans of the opposite (normal) foot to get the dimensions and the specific shape of the bone. It feeds this information into a computer and uses a 3D printer to produce a compatible implant. Dr. Myerson places these implants in the patient's ankles. The intervention has helped patients regain 50 to 75 percent of their ankle function. The field of 3D bioprinting and medical 3D printing is still in its infancy. Scientists across the globe are investing significant amount of time, money and effort to develop more efficient and cost-effective techniques. Many products are undergoing clinical trials. Three-dimensional bones will soon be accessible to millions of patients suffering from bone fractures and bone defects.